Chai tea benefits on your health are numerous, but most people don’t drink this sweet, spicy, milky warm beverage for those reasons. This delicious spiced tea concoction has been around for centuries and is enjoyed by many cultures worldwide. In general, chai tea is made using a rich dark tea that has steeped for a while, a combination of various spices (and that variation depends on the type of chai you wish to make), warm milk (the heavier the better, so try homogenized), and a sweetener (regular sugar, honey, cane sugar, coconut sugar, stevia or agave syrup if you are diabetic). The health benefits of chai tea mostly come from the heavy blend of fragrant spices in the drink. The most common spices used in chai tea recipes and in chai tea lattes made in most North American coffee houses, are cardamom, cinnamon, cloves, ginger, and black pepper. The word chai (one syllable, rhymes with “pie”) derives from the Chinese word cha, meaning tea. and chai itself has Arabic origins. Chai is the word used for tea in many languages around the world, so it’s a bit funny that in English it’s called chai tea—essentially, we’re saying tea tea. There’s no hard-and-fast rule to understanding the nutritional benefits of chai tea—it largely depends on where you get it from, such as a store or a café. Or if you make it yourself, then it depends on which ingredients you use and how sweet you make it. However, the basics of chai’s nutritional facts are as follows. Tea is good for you because of its antioxidant content. It can help reduce the risk of heart attacks and stroke, and it can even help with weight loss. Then add milk to that, which is a high source of protein and calcium. Then add a variety of spices which are themselves loaded with antioxidants to provide further protection from free radicals, and which also have anti-bacterial properties, can help control cholesterol, and can help improve blood circulation. All of those elements together create a winning cup of goodness that everyone should be drinking. In North America, most people don’t make their own chai tea lattes (which is usually how the drink is prepared in coffee chains) at home with fresh ingredients. Rather, it’s typically purchased as a prepared mix from a supermarkets and all that has to be done at home is to add milk and sweetener, and then heat it up. Even coffee chains purchase the prepared mixtures. The chart below details the nutritional profile of a Tall 12-ounce cup of chai tea from Starbucks. The brand is Tazo, and it’s prepared as a latte made with soy milk. Chai tea latte benefits are numerous thanks to the individual components that make up the tea. It’s all in the spices, and the health benefits of spices such as ginger and cinnamon are well documented. For example, chai tea benefits the skin, especially skin that’s prone to acne, because it helps reduce inflammation. Chai tea can benefit weight loss efforts thanks to its combination of fennel, cinnamon, and ginger. The best way to understand chai tea benefits and side effects is to look at each component of the tea separately and then at the specific benefit provided by the tea as a whole. Black tea is loaded with antioxidants that can help prevent cardiovascular disease. It can lower cholesterol, and help fight against some kinds of cancer. Ginger reduces inflammation in the body. It’s an antioxidant that can lower blood sugar levels, and it can also help with nausea and other gastrointestinal ailments. This spice helps with digestion, strengthens the immune system, and has antioxidant properties. Cinnamon helps control blood sugar and aids in digestion. It also has antioxidant properties. Through its fiber content, this herb can help lower cholesterol. It also has potassium and vitamin C, and has antioxidant properties. Cloves can help fight ulcer pain and helps with digestion. This spice also has some antibacterial properties. Black pepper can affect metabolism and may help to prevent the accumulation of fat in the body. It can also help with digestion and some antioxidant and antibacterial properties. Milk is a good source of calcium and vitamin D, and is vital for bone health. Now that we’ve looked at each ingredient, let’s look at the overall benefits of drinking chai tea. 1. Antioxidant benefits: As we’ve seen, many of the ingredients in chai tea have antioxidant benefits, including the tea itself. Why are antioxidants important? Because they help fight off free radicals, and, among other things, they help fight against age-related macular degeneration. 2. Anti-inflammatory properties: The ginger in chai tea is what gives it its anti-inflammatory properties and is also why the tea is a recommended beverage in Ayurvedic medicine. 3. Digestive aid: Three of the ingredients in chai tea aid in proper and better digestion: ginger, black pepper, and cinnamon. 4. Strengthens the immune system: The cardamom and ginger in the tea add powerful immune-building properties. We’ve heard a bit about free radicals, but it would be beneficial to explain a little about what they are and why antioxidants are important. Free radicals are the byproducts of food digestion (though that’s not the only source), and they exist everywhere in the body. Their presence can eventually lead to the degeneration of the body through the promotion of certain diseases. Free radicals love electrons, and they will steal electrons from other substances as much as they can, which alters the composition of those substances and could make them harmful. But the body has long been used to this molecular assault, and fights against it. This is where antioxidants come in. Antioxidants have an abundance of electrons to give, effectively neutralizing free radicals without being compromised themselves. There is no one standard when it comes to making chai tea. Some versions use only one spice (as noted below for each type) and others use a blend of spices. The spice blend versions offer the most health benefits (and are fragrant and delicious), but try all of them and see which one suits you best. Cinnamon can help fight many different ailments, can lower blood sugar and cholesterol, and may help fight colon cancer. Some people believe cinnamon is an aphrodisiac. If you have a cold, add some cinnamon to your tea (about half a teaspoon) and then add more to taste. Try to use organic cinnamon if possible. Cardamom is part of the ginger family and aids digestion, helping the metabolism to do its job more efficiently, and reduce gas and bad breath. This spice is also considered an aphrodisiac. Cloves have been known to effectively fight off fungal infections and illnesses when used regularly. As well as drinking it, clove chai tea can be applied to the skin to fight off fungal infections. Nutmeg chai tea can help relieve neurological pain. Many people swear by nutmeg to help maintain healthy kidneys and boost the immune system. Is There Any Caffeine in Chai Tea? Unless you use a decaf tea, then yes, there is caffeine in chai tea. Tea, including chai tea, has less caffeine than coffee, so it’s a good substitute if caffeine consumption is a concern. You would need to drink about three cups of chai tea to get the equivalent amount of caffeine in a cup of coffee. One group of people who can benefit from this lower level of caffeine is pregnant women. Chai tea benefits pregnancy because pregnant women need to limit their caffeine intake, so instead of cutting caffeine out altogether, they can instead make the switch. The ginger in the tea will also help with any nausea experienced by the pregnancy. How Much Chai Tea Is Safe to Consume? Chai tea is safe to drink, but some people may have issues with it because of its spices and its caffeine content, even though the latter is fairly low. Pregnant women can consume the drink without much worry, as can the elderly, but some spices, if taken in more than average amounts, can interact with medications. If you decide to drink chai tea every day and/or multiple times a day, check with your doctor to ensure that none of the spices will impact how your medications work. Fennel, star anise, and licorice root are sometimes used in the chai spice mix, and those three spices are known to promote menstruation and labor. Also, licorice is not good to take if you have high blood pressure. What Is in a Chai Latte? What Are the Ingredients in Chai Tea Latte? 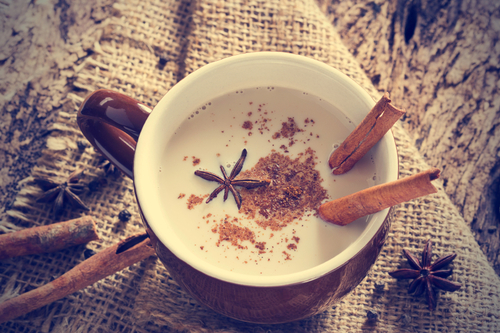 A chai latte is a spicy drink consisting of black tea infused with cardamom, cinnamon, black pepper, star anise, and milk. It’s fresh, spicy, sweet, and milky. Numerous coffee houses in the United States use the term chai latte or chai tea latte to indicate that the steamed milk of a regular latte is mixed with a spiced tea concentrate instead of espresso. In fact, it’s almost unheard of to get anything but a chai latte in these coffee houses, unless a tea bag of chai is available. Then only water is added, and you can add the milk and sugar to taste. Making chai tea at home will result in a far superior product than buying a premade mixture from the store, and the fragrance of the spices will fill your home with warm sweet smells. Below are the basic ingredients needed to make a chai tea at home. Once you make it homemade you won’t want any other kind. 1. Put all five spices in a pan and crush with the back of a spoon or mallet. This will release the oils and make the tea more flavorful. 2. Add the water and bring to a boil. Once boiling, lower to medium heat and let simmer for 10 minutes, partially covered. 3. Remove from heat, add tea bags, and let steep another five minutes. Remove tea bags and discard. 4. Add sugar and milk. Whisk to help sugar dissolve. Strain and serve hot. There is caffeine in chai tea, so be aware of that if you’re sensitive to it. Pregnant women need to drink with caution because of the spice combination. Drug interactions can occur (again, because of the spices) so check with your doctor to be sure. Chai tea is a delicious hot beverage that can be consumed every day. It might be beneficial for those who drink a lot of coffee to consider making a few cups of chai tea instead. What Are the Benefits of Drinking Tea to Manage High Cholesterol Levels? “Chai Recipes,” Chai Tea web site; http://www.chai-tea.org/whatisit.html, last accessed March 31, 2016. “Nutrition Facts,” Self Nutrition Data web site; http://nutritiondata.self.com/facts/foods-from-starbucks/9645/2, last accessed April 1, 2016. “Antioxidants: Beyond the Hype,” Harvard T.H. Chan web site; http://www.hsph.harvard.edu/nutritionsource/antioxidants/, last accessed April 1, 2016. “Chai Tea and Pregnancy,” Livestrong web site; http://www.livestrong.com/article/186854-chai-tea-pregnancy/, last accessed April 2, 2016. “Homemade Chai,” Epicurious web site; http://www.epicurious.com/recipes/food/views/homemade-chai-201226, last accessed April 2, 2016. “Chai Tea Mix,” All Recipes web site; http://allrecipes.com/recipe/46777/chai-tea-mix/, last accessed April 2, 2016.